(OPride) – The unrestricted flow of foreign aid to Ethiopia amid rampant human rights violations and restrictive political environment threatens the Horn of Africa country’s continued existence, opposition officials said on Thursday. Dr. Berhanu Nega, chairman of the outlawed opposition Ginbot 7, underscored democracy and human rights as twin pillars to the survival of Ethiopia as a nation, warning about looming crisis and a civil war unless genuine democratization by responsible and accountable leaders is sought. An unstable Ethiopia threatens the stability of the Horn of Africa as a whole– a region already fraught with conflicts, he told U.S. officials at the House of Representatives. 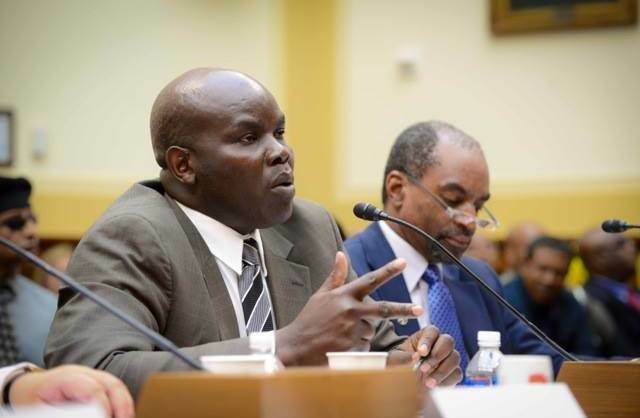 The statements were made at a bipartisan hearing arranged by Congressman Christopher H. Smith (R-NJ), Chairman of U.S. House Subcommittee on Africa, Global Health, Global Human Rights, and International Organizations. The hearing entitled, ‘Ethiopia After Meles: The Future of Democracy and Human Rights’, assessed the status of governance and human rights in Ethiopia vis-a-vis U.S. relations after the death last year of Meles Zenawi. Zenawi died of undisclosed illness on Aug. 20, 2012 after ruling over an increasingly authoritarian state for 21 years. Witnesses included Donald Y. Yamamoto, Assistant Secretary of State at Bureau of African Affairs and former U.S. Ambassador to Ethiopia; Earl W. Gast, Assistant Administrator at Bureau for Africa for U.S. Agency for International Development; Dr. Berhanu Nega, leader of opposition Ginbot 7 and former Addis Ababa city mayor-elect; Dr. Peter Pham, Director of Michael S. Ansari Africa Center at the Atlantic Council; Mr. Obang Metho, Executive Director of Solidarity Movement for a New Ethiopia; and Mr. Adotei Akwei, Managing Director for Government Relations at the Amnesty International USA. The witnesses discussed Ethiopia’s litany of human rights violations, crackdown on activists, harassment of civil society and organizations, unconstitutional meddling in religious affairs, restrictions on independent media and political opposition as issues needing urgent solution. Opening the extended hearing, congressman Smith remarked, the U.S. government has been reluctant to seriously hold Ethiopian authorities to account for “persistent and egregious human rights violations.” This he said was because of Ethiopia’s “important cooperation” in beating back islamist militants in Somalia as well as in other U.S. counterterrorism operations in the region. Testifying before the Committee, Mr. Yamamoto acknowledged Ethiopia’s flagrant human rights record “creates tension” in U.S. engagement with the country. But “we continue to push for press freedom, appropriate application of anti-terrorism legislation, a loosening of restrictions on civil society, greater tolerance for opposition views, and religious dialogue,” said Yamamoto, who served as Ambassador to Ethiopia during President Bush’s second term. As the U.S. looks to diversify its presence in Ethiopia, Yamamoto said, lack of market liberalization and Ethiopia’s investment climate limits American engagement in bilateral trade and investment. “The main sectors of interest to U.S. companies are telecommunications, financial services, logistics, and wholesaling,” he added. “These sectors, however, are closed to foreign investors and U.S. firms are discouraged by Ethiopia’s relatively weak private sector and state-dominated economy.” Yamamoto noted that the U.S. is working with American companies to support infrastructure developments and pushing Ethiopia to open up the political space. “We recently secured agreements to do media development training and open two community radio stations,” he said. Gast outlined initiatives supported by USAID in Ethiopia, including health and education. He noted, over the last decade and half, “Ethiopia has achieved unprecedented growth in universal primary enrollment, which now averages around 95 percent.” However, several USAID national learning assessments have found that the quality of education is extremely lacking. “Rapid growth in enrollment, large classes, and a lack of teaching materials hampered efforts to improve educational quality,” Gast added. A donor darling, Ethiopia receives significant U.S. bilateral aid every year, more than $740 million in 2012 alone – in addition to multilateral aid through institutions like the World Bank. The government is routinely accused of using foreign aid and diplomatic support to suppress dissent and maintain its grip on power. Congresswoman Karen Bass (D-CA), who represents a district that includes Los Angeles’s Little Ethiopia, pushed the U.S. officials to qualify the basis of contradictions in Ethiopia’s records. Why is the government so fearful if Ethiopia has been progressing so well, she inquired. Yamamoto said this was informed by the government’s inability to strike a balance between maintaining security while respecting civil liberties. Dr. Nega’s assessment was less optimistic. He criticized international actors including the U.S. for “shoring up and bankrolling authoritarian rule — with the hope” of achieving a tenuous peace and some modicum of regional stability. He also dismissed the “prevailing conventional wisdom in the west” that says given China’s growing influence, Addis Ababa is not amenable to external pressure. “The Ethiopian government is amenable…to a coordinated, no-nonsense financial pressure that conditions western aid on clear, targeted, measurable, and time-bound political reforms,” he said. In all, what was noteworthy about the testimonies of the witnesses is their continued reiteration of Ethiopia’s progress over the past two decades. Dr. Pham made lengthy remarks, which at times read much like Ethiopian government’s talking points, lauding what he called “Ethiopia’s historic achievements” under Meles including Eritrea’s successful secession, ethnic federalism, linguistic pluralism and the country’s “economic miracle.” Mr. Pham also sought to shore up the credential of Meles’ little know successor, Hailemariam Desalegn. He noted that the prime minister, a relative new comer, has slowly blazed his own trail despite numerous institutional and political constraints he faces to enact reforms. A glaring issue for many Oromos watching the hearing was the absence of Oromo voice from the discussion. As the largest ethnic group, and an invaluable constituency within Ethiopia, the absence of Oromo representation was simply shocking. 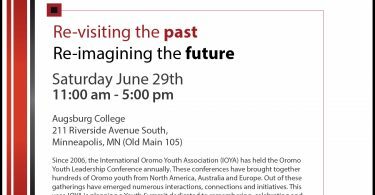 It is even more disconcerting that, even in 2013, Oromos are still not an important constituency to be present at these meetings. Any genuine democratic initiative in Ethiopia without active participation of the Oromo is unlikely to succeed. 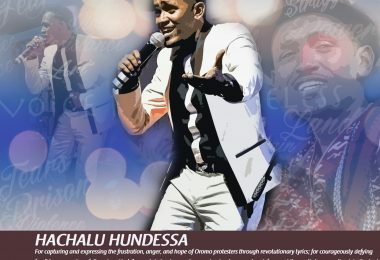 As the single most persecuted bloc, Oromos have disproportionately been dealt with Ethiopia’s ongoing repression. As such, a durable political settlement may only be achieved through inclusive engagement with all segments of the society. Mr. Smith promised to reintroduce the Democracy and Human Rights in Ethiopia Act with “very serious benchmarks.” Representative Bass suggested a follow-up lengthy hearing on the situation, which the Chairman acknowledged. The bill was first introduced by former U.S. Senator Russell Feingold (D-WI) and Patrick Leahy (D-VT) in 2008, and again 2010 “to reaffirm United States objectives in Ethiopia and encourage critical democratic and humanitarian principles and practices, and for other purposes.” The bill ultimately died after it was referred to a committee due to intense lobbying from the Ethiopian government. 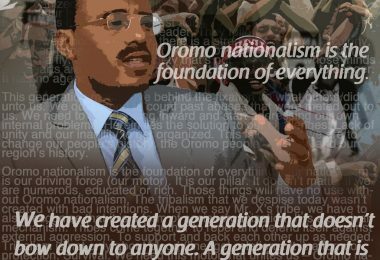 *The full text and videos of their statements can be accessed at http://bit.ly/EthiopiaAfterMeles. For questions contact the editor of this story at editor@OPride.com or on Twitter @OPride. Photo of Mr. Obang Metho, the Executive Director of Solidarity Movement for a New Ethiopia, from the hearing courtesy of Leyou Gennene.